I recently worked together with my colleague Rob Plank to come up with a solution for deploying and storing DSC items using SCSM. In this blog post I will work through the solution that we created. The first thing we needed to do was create some custom classes to store our DSC items. Before we created the items we had to look at the way our DSC pull configuration worked. We found a few important things. For each configuration Type we might have there will be multiple mof files on on the pull server. One for each server with the configuration. After looking at this we decided we needed to create two new CI classes with custom forms. 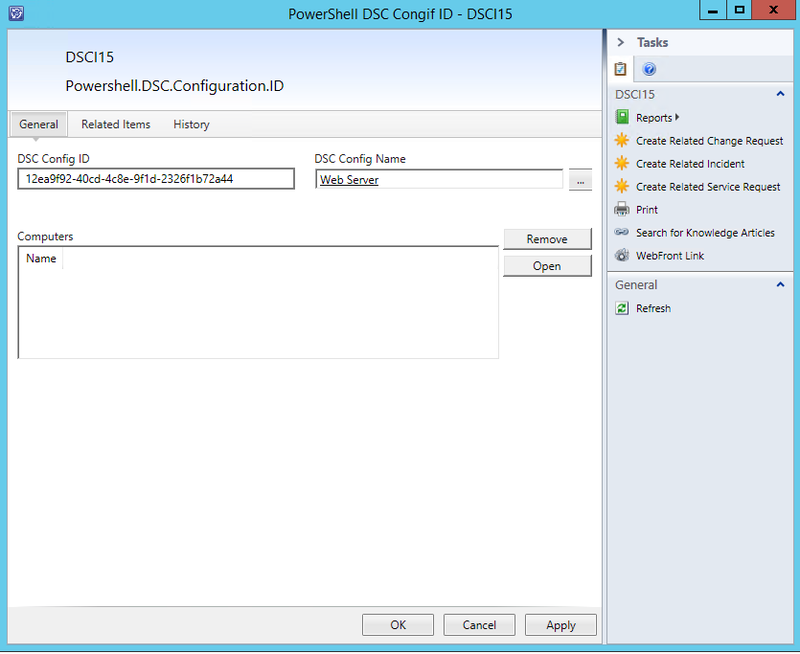 The two new classes were for the DSC Configuration Type and the DSC Configuration ID. By creating these two classes it allowed us to relate multiple DSC Conifguration IDs to one configuration type. We can also relate the DSC Configuration ID to the Computer that it gets applied to. Rob will be writing a blog that covers the Creation of the classes and I will link it here when he is finished.